These questions provide further practice for Parts A and B of Section I of the examination. 1. Which of the following functions is continuous at x = 0? 2. Which of the following statements about the graph of is not true? (A) The graph is symmetric to the y-axis. (B) The graph has two vertical asymptotes. (C) There is no y-intercept. (D) The graph has one horizontal asymptote. (E) There is no x-intercept. 26. Estimate dx using the Left Rectangular Rule and two subintervals of equal width. 31. The curve 2x2 y + y2 = 2x + 13 passes through (3, 1). 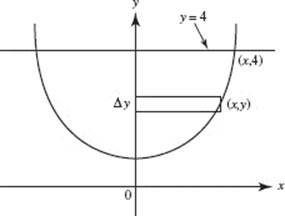 Use the line tangent to the curve there to find the approximate value of y at x = 2.8. 38. 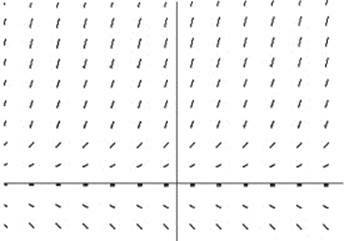 Which of these could be a particular solution of the differential equation whose slope field is shown here? 39. 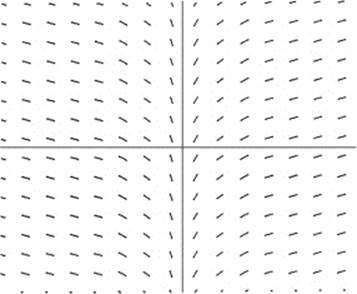 What is the domain of the particular solution for containing the point where x = −1? 50. Which of the following improper integrals diverges? 55. 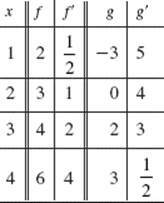 When rewritten as partial fractions, includes which of the following? Part B. Directions: Some of these questions require the use of a graphing calculator. 58. 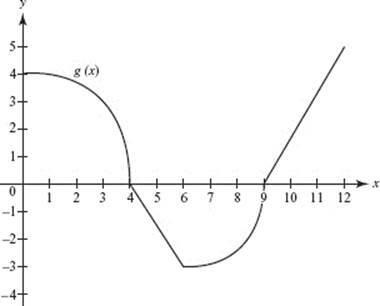 The graph of function h is shown here. Which of these statements is (are) true? I. The first derivative is never negative. II. The second derivative is constant. III. The first and second derivatives equal 0 at the same point. 59. 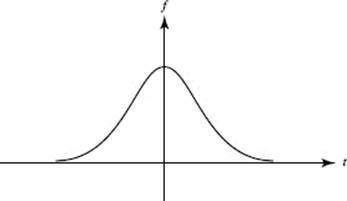 Graphs of functions f (x), g(x), and h(x) are shown below. 62. At what point in the interval [1, 1.5] is the rate of change of f (x) = sin x equal to its average rate of change on the interval? 63. Suppose f ′(x) = x2 (x − 1). Then f ″(x) = x (3x − 2). 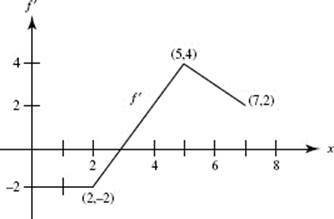 Over which interval(s) is the graph of f both increasing and concave up? 64. Which of the following statements is true about the graph of f (x) in Question 62? (A) The graph has no relative extrema. (B) The graph has one relative extremum and one inflection point. (C) The graph has two relative extrema and one inflection point. (D) The graph has two relative extrema and two inflection points. (E) None of the preceding statements is true. 66. If f (x) is continuous at the point where x = a, which of the following statements may be false? (D) f (a) is defined. 73. Suppose the function f is continuous on 1 x 2, that f ′(x) exists on 1 < x < 2, that f (1) = 3, and that f (2) = 0. Which of the following statements is not necessarily true? (A) The Mean-Value Theorem applies to f on 1 x 2. (C) There exists a number c in the closed interval [1,2] such that f ′(c) = 0. (D) If k is any number between 0 and 3, there is a number c between 1 and 2 such that f (c) = k.
(E) If c is any number such that 1 < c < 2, then exists. 74. The region S in the figure is bounded by y = sec x, the y-axis, and y = 4. 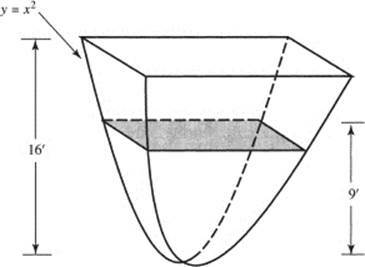 What is the volume of the solid formed when S is rotated about the y-axis? 80. Let for 0 x 2π. On which interval is f increasing? 81. The table shows the speed of an object (in ft/sec) during a 3-sec period. Estimate its acceleration (in ft/sec2) at t = 1.5 sec. 82. A maple-syrup storage tank 16 ft high hangs on a wall. The back is in the shape of the parabola y = x2 and all cross sections parallel to the floor are squares. If syrup is pouring in at the rate of 12 ft3 /hr, how fast (in ft/hr) is the syrup level rising when it is 9 ft deep? 83. In a protected area (no predators, no hunters), the deer population increases at a rate of where P(t) represents the population of deer at t yr. If 300 deer were originally placed in the area and a census showed the population had grown to 500 in 5 yr, how many deer will there be after 10 yr? 85. A smokestack 100 ft tall is used to treat industrial emissions. The diameters, measured at 25-ft intervals, are shown in the table. 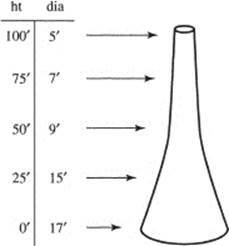 Using the midpoint rule, estimate the volume of the smokestack to the nearest 100 ft3. For Questions 86–90 the table shows the values of differentiable functions f and g.
people per square yard. About how many people are at the concert? 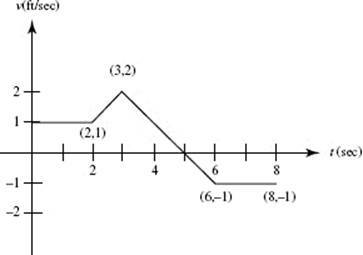 The graph below is for Questions 95–97. 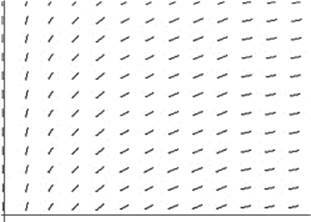 It shows the velocity, in feet per second, for 0 < t < 8, of an object moving along a straight line. 96. When did the object return to the position it occupied at t = 2? 98. If a block of ice melts at the rate of cm3 /min, how much ice melts during the first 3 min? 103. Suppose we plot a particular solution of from initial point (0, 1) using Euler’s method. After one step of size Δx = 0.1, how big is the error? 104. We use the first three terms to estimate Which of the following statements is (are) true? I. The estimate is 0.7. II. The estimate is too low. III. The estimate is off by less than 0.1. 105. Which of these diverges? 108. An object in motion along a curve has position P(t) = (tan t, cos 2t) for 0 t 1. How far does it travel?